Everyone’s off to Davos. Okay, not everyone – but a surprising number of white men have converged on one snowy village. But before you get all high and mighty, it’s not all chief execs and politicos – these days the World Economic Forum has gone downmarket enough to include royalty of the actual and BBC variety. Detailed RF analysis projects that on these plebifying trends Davos Man in 2025 is set to be… Danny Dyer. Which would have the advantage of being both very funny and so traumatic for everyone that the whole thing might get shut down. Attention could then even turn to doing something about inequality rather than workshopping it between ski runs. For those of you whose invites got lost in the post, console yourself with the news in our first read this week that your extra leisure time is good both for you and the economy as a whole. Have a good weekend, whether in Davos or Daventry. Time is money. The ‘GDP is rubbish’ theme sustains a whole subfield of the economic blogosphere, but constructive alternatives are a lot less widespread. Into that gap comes a thought provoking new blog (and discussion paper) by Cambridge economist Diane Coyle suggesting a comprehensive new measure of welfare – the wellbeing effect of how people’s time is spent between work, leisure, chores etc. This is particularly relevant as the (time intensive) production and consumption of services, many driven by the digital take-over of our lives, become key features of our economies. This measure would also better capture the long-run trend by which hours devoted both to paid work and to home production have been declining, leaving more time for leisure. This is an issue we’re currently working on at RF, but one conclusion for government is plain: let’s invest more time in collecting data about how people pass their time. Music is $s. While we’re on updating our economics for the 21st Century, it’s worth keeping an eye on one of the first sectors to see significant digital disruption: music. How we listen to music has changed beyond recognition, but what about how musicians are paid for it? A recent blog delves into this issue in detail, with a focus on Sweden’s highest profile, non-flat pack based, company – Spotify. When a listener plays a track Spotify doesn’t pay a proportion of their subscription fee to that artist. Rather, artists get paid a proportion of Spotify’s entire pay pot, in proportion to their share of everyone in the world’s track plays. The piece argues this ‘winner-takes-all’ model rewards artists producing easy listening tracks, but squeezes mid-tier artists out. This is a useful reminder that, as tech changes business models, it also changes the fields of battle for economic power. Brexit beyond the £s. Brexit is a huge deal for Britain, representing a genuinely historic realignment of the UK’s national strategy, far beyond the pounds and pence of tariff rates or the £39bn exit bill. This is sometimes lost in debates about exactly how many ‘+’s to put after the words Canada or Norway. Fortunately it takes centre stage in an excellent new essay by Gavin Kelly and Nick Pearce. They ask: how has four decades of EU membership transformed Britain, and what are the implications of leaving the EU for its future? The essay offers a magisterial overview of British capitalism’s past, present and future. Well worth your time. Controlling the £s? This week Shadow Chancellor John McDonnell ruled out (£) a Labour government imposing capital controls (limits on amounts of money leaving the UK that were abolished under Thatcher). It shows how far debates have moved that Labour feels the need to rule this out – just a few years ago no-one would have thought them a possibility. However, some on the left have recently argued that without them you can’t raise taxes on the rich. And just as they are being ruled out here in the UK, others are reassessing the consensus that they are such bad idea. One surprising home of this reassessment is the IMF, where the star Harvard professor Gita Gopinath has taken over as Chief Economist (the first women to do so). This must-read short paper from 2017 argues that, in some circumstances, ‘there are sound arguments for intervening in capital markets, including the use of capital controls’. However, she also recognises the benefits from cross-border capital flows of some types. Wasting the £s. Today HMRC have updated their useful estimates of what different tax rises/cuts would raise/cost. It’s worth a browse for any of you that like to put together your own fantasy budgets. But it also highlights a big fiscal mistake we’re about to make. The projected cost of the Treasury’s planned April 2020 2p cut to corporation tax has been revised up (again) to over £6bn a year. Going ahead with it is bonkers as we enter an era where the demographics trends require higher taxes, but the politics makes individual tax rises difficult. We already have one of the lowest corporation tax rates amongst advanced economies, so there’s not even an argument for these tax cuts from a competitiveness point of view. When you’re already winning the race to the bottom you don’t need to speed up. Chart of the Week focuses for a change on what we spend, rather than the money we’ve got coming in. 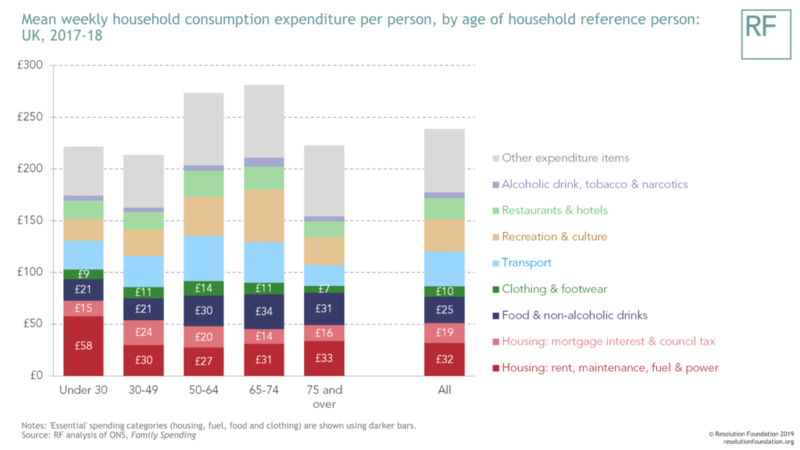 Using new data out yesterday it shows how much households spend per person on different things. The headline result is that older households spend more (we’ve touched on the myth of millennials being the big spenders/avocado eaters before). Strikingly 50-75 year olds spend twice as big a share of their consumption on recreation and leisure (which includes package holidays) as the under 30s do. Good news for Med cruises, less so for Club 18-30.